5 Points Win your first game. Battle Blader I 5 Points Earn 500 BP. Battle Blader II 5 Points Earn 1000 BP. Bronze 5 Points Win Tournament Bronze. Shopping 5 Points Buy a new part. Battle Blader III 10 Points Earn 2000 BP. Battle Blader IV 10 Points Earn 5000 PB. Silver 10 Points Win Tournament Silver. Gold 25 Points Win Tournament Gold. 5 Points Submit a world. 5 Points Load a world from the server. 5 Points Crashed for the second time. 5 Points Crashed before start line with 0 score. 5 Points Reached 1 point score. 5 Points Crashed for the first time. 10 Points Crashed 8 times. 25 Points Crashed 16 times. Broken Steer 5 Points Crashed without turning left nor right. Clockwise or Counter? 5 Points Tried both preferences of direction. Second Score 5 Points Reached 2 points score. The C Button 5 Points Checked the Credit screen. The Mouse and The Keyboard 5 Points Tried mouse and keyboard for playing. Even More Scores 10 Points Reached 8 score. More Scores 10 Points Reached 4 points score. More Than Fingers Can Count 25 Points Reached 11 points score. Still Surviving 25 Points Reached 16 points score. Being Tough 50 Points Reached 24 points score. Crashed so Many Times 50 Points Crashed 32 times. More Than Fingers and Toes Combined 50 Points Reached 21 scores. Masochist 100 Points Crashed 64 times. Square Masochist 100 Points Reached 32 points score. 25 Points Collect and give 3 coconuts! 25 Points Drink a delicious smoothie! Crab Catcher 25 Points Catch a crab! Get Connected! 50 Points Get your cell phone! 5 Points Get a score of 100 or above! 10 Points Get a score of 150 or more! Math Pro 50 Points You're a mathematician! 5 Points You managed to score 25 points! 50 Points 10 Points Managed to score 50 points! 75 Points 10 Points You've managed to score 75 points! 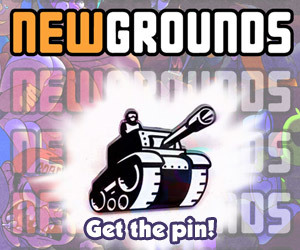 Proud Newgrounds Member 25 Points You know your stuff!